This text gives all the readings of the three most ancient codices—Alexandrinus, Vaticanus and Sinaiticus. This text gives all the readings of the three most ancient codices—Alexandrinus, Vaticanus and Sinaiticus. Although worthwhile readings from other sources, including the Papyri, the evidence of the Fathers, ancient versions, later manuscripts and modern scholarship were given ample consideration, it was found that the three major ancient texts contain every letter which modern editors deem genuine. Our CONCORDANT GREEK TEXT allows the reader to see every passage just as it was penned nearly two thousand years ago, in the ancient uncial alphabet. An ultra-literal and consistent English sublinear is provided which uniformly expresses the Greek grammar with English standards. Wherever possible the first letter of the English standard in the sublinear stands directly under the first letter of the corresponding Greek word. With a format uniform throughout to facilitate reference, there are 20 Greek letters to the line and 50 to the column, giving 1000 to the page. Readings variant from the basic text are given in the superlinear. 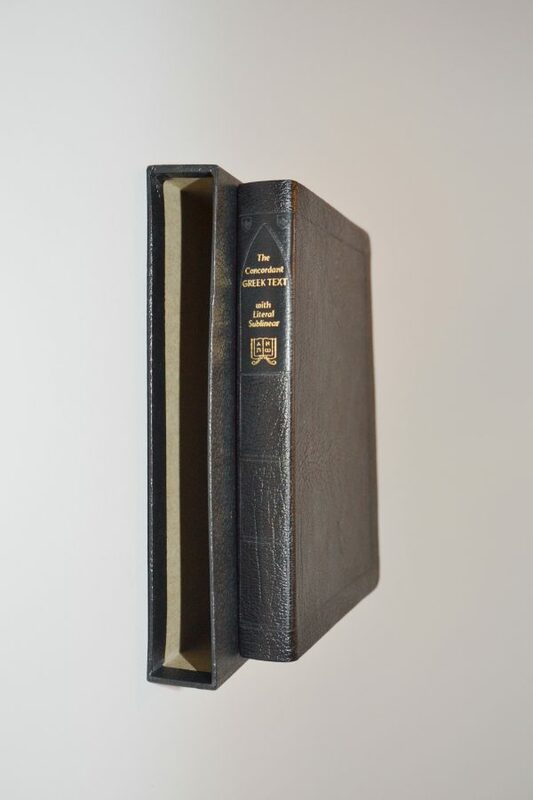 Black genuine leather, gold edging, 735 pages.